There are times when daily mundane life calls for something more. A gust of fresh air to rejuvenate the inner being & to hit back life with all the energy. That one trip, which will make the change & give us a chance to explore. With this in our mind, we created Thailand Calling. An offer uniquely crafted to give rummy players an opportunity to explore nature & to discover. Thailand Calling was a customized trip, where the winner makes his way to Thailand and chooses his exotic destination. The prize included Air Fare, Hotels, Local Transport, Shows, Tours and Safari in the cities and their vicinities. The offer began on the 1st of January and was a month long venture for our players. The requirement to avail the offer was very simple; Play Rummy and Win a Raffle Ticket. Wagering of a player in the month of January decided how many raffle tickets they earned. The more players wagered, the more number of raffle tickets they won, maximizing their chances of Winning the Trip to Thailand. A total of 14803 raffle tickets were earned in the course of 1 month. On 1st Feb the Winner of the Grand Raffle Draw and an Awesome Trip to Thailand was announced LIVE on Facebook, YouTube and our Website. We wish the winner our very best for his amazing trip to Thailand. 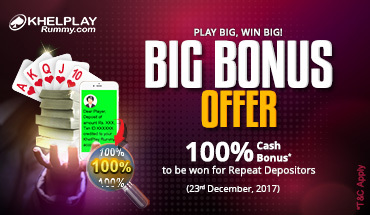 And as for the rest of our rummy players watch out for more such offers at KhelPlay Rummy.